From the vendors… Tuscany is one of the most popular elopement destinations in Italy. Most of couples get marry during the summer months, but the Fall season has its own advantages, namely in the lack of crowds and tourists and in the beautiful colors of the landscape. And that was my first thought when Esther and Gabe, the talented husband and wife photographers from The Bell Weddings, contacted me for a shoot in Tuscany. The gown from the Atelier of Marianna Lanzilli , the beautiful shoes from bella belle shoes that paired with the dress so perfectly The table and its warmly coloured palette, the flowers that Gianluca from Heaven Flowers crafted, the venue and its delicately hued wall whose nuances elegantly match the color of the season in a harmonious symphony. I used the Fall palette of the season with browns and neutrals being the the prevailing tones, along with shades of red from the vineyards and the foliage, lilac and pastel for the sunset and greens which you can find throughout Tuscany. 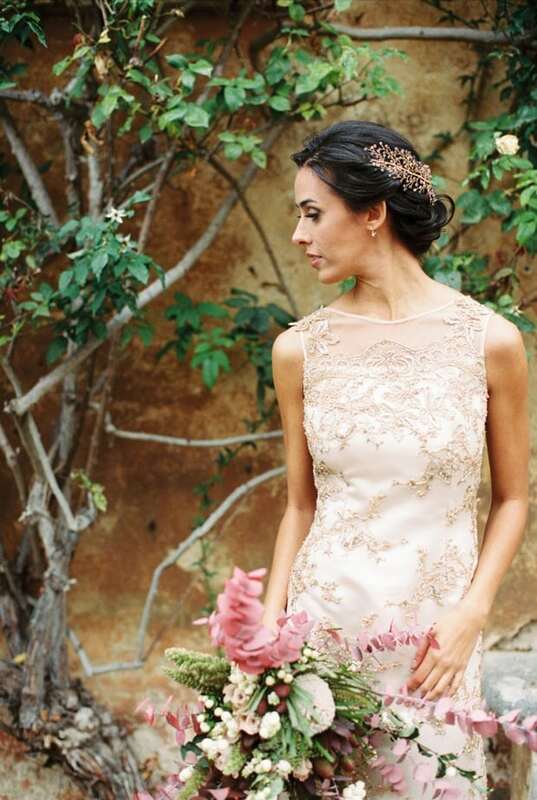 The bride’s golden dress added a magical finality to the look. And, Esther and Gabe’s attention to details and eye for creative shots is something to be envied.